2009 – 2011 Undertook modules that can lead to the Institute of Directors award of Chartered Director: Role of the Director and the Board & The Director and the Law; Finance for non-Financial Directors. 2000 – 2001 PgCert, University of Plymouth: Learning and Teaching in Higher Education. 1992 – 1996 PhD, University of Plymouth: Remote Sensing of Suspended Sediment. 1989 – 1992 First Class BSc Honours Degree in Oceanography and Marine Computer Applications, University of Plymouth. 2015 – Trustee, Sir Alister Hardy Foundation for Ocean Science (www.sahfos.ac.uk). 2013 – Director, Ocean Nourishment (UK) Limited (www.oceannourishment.com). 2011 – Managing Director, Pixalytics Ltd (www.pixalytics.com). 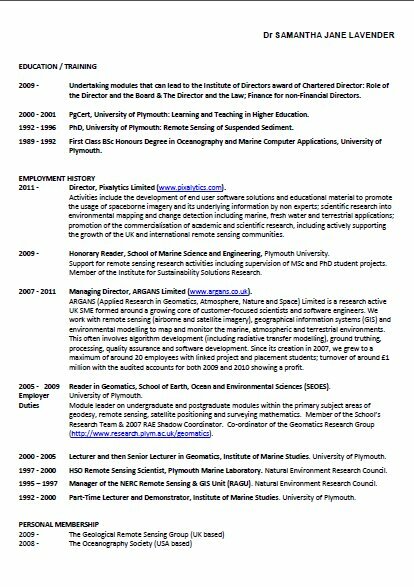 2009 – Honorary Reader, School of Marine Science and Engineering, Plymouth University (www.research.plym.ac.uk/geomatics). 2007 – 2011 Managing Director, ARGANS Limited. 2005 – 2009 Reader in Geomatics, School of Earth, Ocean and Environmental Sciences. 2000 – 2005 Lecturer and then Senior Lecturer in Geomatics, Institute of Marine Studies. University of Plymouth. 1997 – 2000 HSO Remote Sensing Scientist, Plymouth Marine Laboratory. • Cristina, S. 2016. Study of optical properties of oceanic and coastal water southwest Portuguese coast using remote sensing data acquired by the sensor MERIS ocean colour. Based at the University of Algarve. • Morakinyo, B. 2016. Flaring and Pollution Detection in the Niger Delta. Based at the University of Plymouth. • Zhang, D. 2014. Remote Sensing of Phytoplankton Characteristics in The Baltic Sea. Based at Mullard Space Science Laboratory (University College London). • Krijnen, J. 2013. Remote sensing applied to variability in North Atlantic CO2 uptake. Based at the University of East Anglia. • Abdel Hamid, I. 2012. Chromo-Stereoscopic Visualisation in Dynamic Marine Operations. Based at Plymouth University. • Kay, S. 2011. Sun glint correction of marine satellite imagery by radiative transfer model inversion. Based at the University of Exeter & ARGANS. • Davey, F. 2011. Research Interests in GIS and remotely sensed data for landscape character assessment. In collaboration with Tamar AONB Service. • Brewin, R. 2011. Detecting Phytoplankton Size Class using Satellite Earth Observation. Based at the University of Plymouth and in collaboration with Plymouth Marine Laboratory and the UK MetOffice. • Barker, K. 2009. Novel Techniques for Estimating Primary Production Rates directly from Earth Observation Data. In collaboration with Plymouth Marine Laboratory. • Fishwick, J. 2008. Biological and Optical Properties of Phytoplankton Assemblages in the Western English Channel. In collaboration with Plymouth Marine Laboratory. • O’Neill, C. 2008. Identifying and modelling mesoscale processes responsible for deep sea-shelf exchanges over the Rockall Bank. • Ostnes, R. 2005. To Assess the Opportunities and Benefits of Improved Visualisation of Hydrographic Data. In collaboration with Aalesund University College, Norway. • Lowe, C. 2005. Satellite Remote Sensing of Characteristic Properties and Photosynthetic Rates of Phytoplankton Ecosystems. In collaboration with Plymouth Marine Laboratory. • Nagur Cherukuru, R.C. 2004. Remote Sensing of Optically Active Marine Components. In collaboration with Plymouth Marine Laboratory. • Alboabidallah, A. Error Propagation Analysis on Remotely-Sensed Above-Ground Biomass Used to Estimate Carbon Sequestration. Based at the University of Plymouth. I have been an external PhD examiner five times in the UK and four times overseas (Belgium, France, Sweden & Indonesia), and an internal examiner twice in the UK. PEER-REVIEWED PUBLICATIONS (in total I’ve been an author/co-author on over 75 peer-reviewed publications). See papers for a recent list (including onwards links/downloads) and Scopus for a longer list.